The late Senator Claro M. Recto, was one of our most intense and consistent nationalist in Philippine history. In retrospect, I find it unfortunate that I was not politically aware during his lifetime since his time was during my early teen years. I became aware of and remember Recto only when our Father Superior mentioned that the latter, whom he labeled a "communist," just died while in Rome (Recto was a target of CIA Assassination Plots; makes me think too of young and outspoken Capt. Rene Jarque who suddenly died of heart attack while abroad, like Recto). Anyway, it was only after I bought THE RECTO READER did I start "knowing and learning from" Recto and beginning to appreciate nationalism, that is, Filipino nationalism. It was only after reading the book did I get information and developed a greater understanding of our national predicament. The Marcos Dictatorship, after the 50-year American intervention, occupation and colonization of our homeland overtly and covertly muted our nationalism, was instrumental in pushing back the struggle for nationalism, making mileage of the usual "fear of communism"as an excuse to obtain more aid from the United States and to maintain his position of power and those of his cronies and military backers. So did his successors Cory Aquino, Fidel Ramos, Joseph Estrada, Gloria Arroyo, and currently Benigno Aquino III and most of their legislators; all --while paying lip service to the uninformed majority-- were more attuned to the desires of, and acted/act for foreigners and foreign institutions; their local partners and supporters; all at the expense of us native Malay majority who consequently became a minority (in terms of decision-making in our own native land). For how long shall we allow such traitorous rulers? In the last half-century since our so-called independence, all these rulers have not really ruled for the betterment of the native Filipino. It is truly sad and maddening that our recent and present rulers since the Marcos Dictatorship have actively allowed the neglect of fostering Filipino nationalism in our society. Such has happened because our native rulers, bureaucrats and technocrats in government, business and military themselves have no nationalism as we understand it. In lieu, they have time and again planned, decided and acted to please the foreigners/aliens; in short they have literally prostituted our native people and homeland. Gradually, foreigners have established themselves in our own "house" and have influenced changes in it to suit them. It therefore behooves us the citizenry to force and make the rulers, whoever they are now and in the future, to work for the common tao (masa). And Filipino nationalism should be the bottomline for all plans, decisions and actions. It would be extremely beneficial for our homeland and our countrymen to become aware of, that within our territory, today and the future, through our homes and schools, of nationalism. Filipino nationalism is the missing link to correctly plan for, decide and act towards the realization of our common good. It is great that we had Recto and Constantino in the recent decades to expound on Filipino nationalism and though they now are both gone, they live in their writings on nationalism. We Filipinos need mass education for nationalism to reverse the present dumbing down of the native Filipino. We need to overcome the impediments to Filipino nationalism. Armed with knowledge and understanding of our Filipino nationalism, we know we can change as a people, truly united with chosen nationalist leadership (not lapdogs of foreigners as we had since so-called independence in 1946) towards completing and attaining the goals of the unfinished revolution our revolutionary forefathers fought and died for. As long as we natives do not appreciate and regain our national consciousness, our nationalism, we will never earn any respect as a sovereign people, from fellow Asians, from other peoples of the world and those aliens and foreigners in our land who are greatly benefiting from our lack of nationalism, from our resultant lack of national unity. We native Filipinos have to fight back to regain our homeland, peacefully or not; if not for ourselves now, surely for our next generations of native Filipinos. 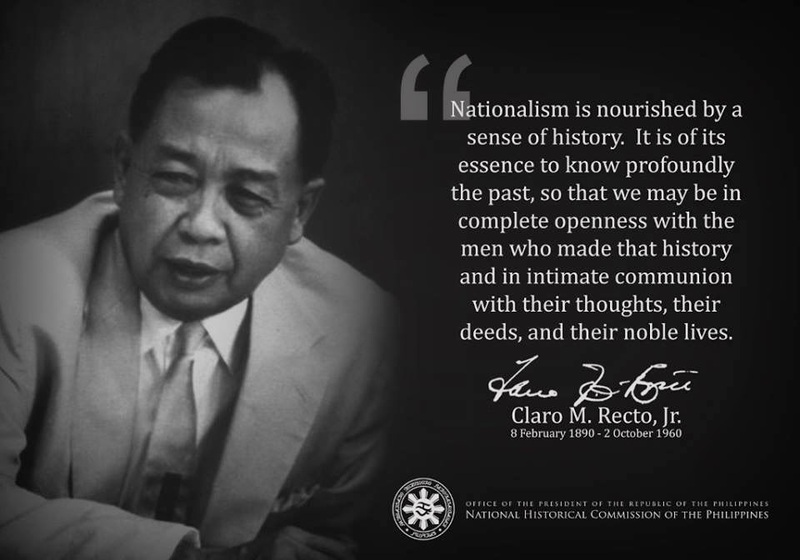 Let's now start reading and learning from Recto the "what, why, how, where and when" of authentic Filipino nationalism, the sine qua non for really loving our native land, now as he did then: thinking, planning, deciding and acting for the homeland and our native people. NOTE: I added at the bottom of post a short bio of the late Sen. Claro M. Recto, by the Civil Liberties Union, 1990, his Centennial year. This parity clause, it need not be said, is grossly unfair. This is, indeed, the first instance in history where an independent nation has granted to citizens of another rights equal to those enjoyed by its own citizens. The irony of the thing lies in the fact that were we to seek, for the sake of reciprocity, the same rights from the United States.....we would be met with the observation, which is unanswerable, that it is not within the power of the United States government to grant any such equal rights to citizens of another country. As the State department representative apologetically said during a committee bearing: " I feel they (the Filipinos) should not be forced to give American citizens special rights which we can not give to Filipino citizens." Many of us believe that we are "independent." We are often complimented by our big "partner" in the "special relationship" that we are independent. But he behaves and acts towards us in a manner that indicates quite the contrary. he imposed upon us ten years ago the Bell Trade Act-1946, together with "Parity". One of our recurring economic headaches is the low level of our dollar reserves. That we need dollars is a fact, but we should not be over-dependent on the dollar, we should not be morbidly dollar-conscious. The interest which other countries have shown in our products proves that we could develop other markets and expand our trade with them if only we did not insist on dollar payments. Those countries who want to buy from us also have goods which we could use. Only our fear of untying ourselves from Mother America's economic apron-strings prevents us from developing more profitable trade relations with other countries. Of course, certain foreign interests which may be adversely affected by our new outlook would try to exert pressure on our government to scrap such a plan. That is only natural, but the danger is that a leadership that is not nationalistic might bow to such pressure. This is what is happening in the past. But a leadership which sincerely proclaims its adherence to the principle of economic nationalism will push ahead resolutely with only one purpose in mind -- the well-being of the Filipino people, now and in the future. Although it must be admitted that there is a need for dollars for the importation of capital goods from abroad, it should not be overlooked that in any industrialization we have to depend mostly on internal financing. The reason is obvious. For payment of wages, which constitutes the bulk of the cost of production, and of raw materials locally produced, we use our currency. We only need dollars or yens or pounds for foreign purchases. Capital is always necessary in economic development. Other things being equal, the greater the capital the larger the production and the faster the rate of economic growth. In our present state, considering the scarcity of Filipino capital, there is a need for foreign capital if we expect any acceleration in our economic development. But the foreign capital we need is for the purchase of capital goods which we cannot produce or manufacture locally. Foreign capital in excess of what is necessary to meet this particular need will do us more harm than good. Here it is necessary to explain briefly between foreign loans, public and private, and foreign direct investments. When we borrow money from abroad, say from the U.S., to use for our economic development, the Filipinos became the capitalists. They will pay interest to their foreign creditors, but through the use of credit they would make profits well above the interests they will have to pay. Thus our capitalists would retain the profits. Even if foreign direct investments would afford some local employment to local labor, that would not help in our domestic capital formation because salaries and wages are, as a rule, all spent on daily needs and are not saved. They are hardly ever a source of capital formation. Inasmuch as profits and savings therefrom are the only sources of capital formation, those profits that belong to foreign capital can not help promote our own capital formation; consequently, there is no increase in our capacity to produce. Parity opens the door to foreign direct investment. In fact, foreign investment constitutes the very motivation for parity rights. The wider the door the more easily such foreign investments will enter. And with the doors of Japan and the 20 Latin American republics and the Colombo powers shut against foreign investments, the more they would be funneled into our open door. It is well to remember again the experience of Latin America. The Latin-Americans had no parity with the United States. It was superior experience of American business in technique, organization, know-how, etc. --the result of a much earlier industrial development --which caused the displacement of Latin-American businessmen in Latin America and retarded the growth of local, native, industrial capitalism in that area. Our own need to protect ourselves from that superiority is greater than that of the Latin Americans because of the parity rights enjoyed by U.S. citizens and corporations in the Philippines. A a distinguished Filipino economist pointed out on one occasion, "because of the overwhelming advantage in industrial efficiency which the U.S. enjoys, it would be impossible for the Philippines to achieve even moderate progress in industrialization unless some form of protection is afforded its infant industries." The imperative need of the Philippines to protect itself from an economic invasion by one possessed of such "overwhelming advantage of industrial efficiency," could not have been expressed more clearly. Puerto Rico has been presented to our leaders as the show-window of industrialization and economic development. many have been invited to witness the prosperity of Puerto Rico. Indeed that country is rich and prosperous, territorially speaking, and is bound to become more so. But are the Puerto Ricans themselves prosperous? They are not, because the wealth of Puerto Rico is concentrated in the hands of foreign investors. Puerto Rico was challenged to accept an offer of national independence if the people wanted it. The "elected" representatives of the people overwhelmingly voted against independence. (31) Our Trade Relations with the United States, April 4, 1954. (32) A Realistic Foreign Policy for the Philippines, August 18, 1956. (33) The Role of Labor in Our Economic Emancipation, September 8, 1957. (34) Economic Nationalism, March 28, 1957. (35) The Need of Foreign Loans in Our Economic Development Program, May 18, 1960. Claro M. Recto, 1890-1990: a centenary tribute of the Civil Liberties Union, Quezon City: Karrel, 1990?. "The free trade relationship, which encouraged producers to concentrate on a few export crops, meant the continuation of a dependent and predominantly agricultural economy in the Philippines." - Shirley Jenkins, American Economic Policy Towards the Philippines, STANFORD UNIVERSITY PRESS, 1954. Please note the below statement regarding a major and disastrous impact of Parity Rights on our national patrimony; and consequent generational poverty of the native Filipino majority.